A day in the water is great fun for every child, and making it a safe day in the water means even more enjoyable for the parent. In addition to the flotation swimsuits, Swim-sters swim diapers and sun protection products. My Pool Pal offers customer service and a panel of experts to help you with any questions or concerns you might have. Our two piece Swim Diaper Sets and Swim Diaper Trunks with built-in Swim-sters help give you the safety and germ protection of a quality swim diaper with the added style of adorable swim suits and swim trunks in a variety of prints and colors. Check out our selection of Swim Diapers Sets and Swim Trunks get your child ready for a safe and enjoyable day at the pool. No day by the water is complete without adequate sun protection. While sunscreen should always be your first layer of defense, there's even more you can do to protect your child from the harmful rays. The My Pool Pal Sun Hats, Sun Suits, and Rash Guards are a great way to boost your sun protection efforts. Every My Pool Pal Sun Hat and Sun Suit provides SPF 35+ protection. Our Sun Hats are available with neck flaps for boys and as floppy hats for girls, and our Sun Suits are offered as a one piece or rash guard set. 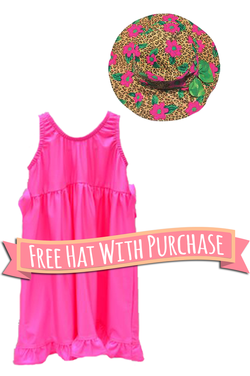 Plus, our Sun Hat prints coordinate with our boy's and girl's Sun Suits, flotation suits, and swim diaper sets.